One diplomat told Reuters tension between the U.S. and China, bubbling all week, erupted when the Chinese government’s top diplomat, Wang Yi, objected during a leaders’ retreat to two paragraphs in a draft document seen by Reuters. One mentioned opposing “unfair trade practices” and reforming the WTO, while another concerned sustainable development. “These two countries were pushing each other so much that the chair couldn’t see an option to bridge them,” said the unnamed diplomat. "China was angered that the reference to WTO blamed a country for unfair trade practices." Instead of issuing a document that all 21 participants could agree O’Neill, said he would issue a “chair’s statement” reflecting the issues the participants did agree upon. The prime minister said the main area of disagreement was the insistence by one country — believed to be the US — that the communique would reflect the need for reform at the World Trade Organization. O’Neill also said there had been disagreement on the bloc’s so called “Bogor Goals”, which require it to achieve free and open trade among its developing economies by 2020. And while O'Neill said the differences on that issue had been ironed out, there was no such luck when it came to the topic of WTO reforms. President Trump has previously threatened to pull out of the organisation, claiming that its rules unfairly favoured China. O’Neill did not say which country objected to WTO reforms but added: "Apec has got no charter over World Trade Organisation. That is a fact. That matter can be raised at the World Trade Organisation." China has said it broadly supports the WTO, while European Union proposals to reform the institution are expected to be tabled at the G20 summit in Argentina, where Trump and Xi are planning to meet in an effort to resolve their differences. Additionally, Sunday’s developments also came with a side plot, with China pushing back against accusations that its officials had tried to “barge” their way into the office of New Guinea’s Foreign Minister Rimbink Pato in an attempt to influence the communique. Citing three sources, a report by Agence France-Presse claimed that police had been called to turn the Chinese away. Pato told Reuters the Chinese officials who had come to see him had been refused a meeting because they had not made the “necessary arrangements”. Separately, Wang said that leaders had “made considerable progress” at the summit and “reaffirmed their common commitment to keep the momentum going. We will leave it now to hands of the host nation to capture the consensus that emerged during discussion" although according to media reports there was virtually none. A senior government source from a Southeast Asian country told the South China Morning Post the last-minute talks had been “very tense”. “Try as we did, we couldn’t come to an agreement on certain trade issues. The gulf was too big. The US and China could not see eye to eye... I am not too surprised at the outcome,” the source said. Underscoring the dramatic tension between the two superpowers, another source told SCMP that while Asian countries had expected some disagreement over WTO reform, they did not expect the US and China to hold out to the extent of blocking a final communique. The source said the failure of the bloc’s foreign ministers to issue a statement ahead of the summit, something that is usually a formality, was also down to their differences over the issue. A source from Taiwan said delegates had been working to reach a consensus until the small hours of Sunday. They were then told on Sunday morning that some delegations wanted to make “some comments” on the proposed communique as leaders met for a retreat and a working lunch. Finally, O’Neill told reporters his chair’s statement would be issued later on Sunday, but it had been not released by the secretariat at 8pm local time (10am universal standard time). 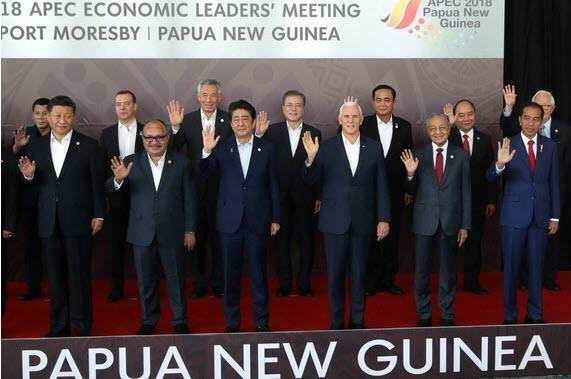 Pence, who left Papua New Guinea on Sunday afternoon along with Xi, said there had been major differences between his country and China. “They begin with trade practices, with tariffs and quotas, forced technology transfers, the theft of intellectual property. It goes beyond that to freedom of navigation in the seas [and] concerns about human rights,” he said. As Bloomberg summarizes and as discussed yesterday, Pence sharpened U.S. attacks on China during a week of summits that ended Sunday, most notably with a call for nations to avoid loans that would leave them indebted to Beijing. He said the U.S. wasn’t in a rush to end the trade war and would “not change course until China changes its ways” -- a worrying prospect for a region heavily reliant on exports. Meanwhile, the brittle geopolitical balance of power in Southeast Asia is emerging as another major point of conflict between the two superpowers. While the U.S. can depend on allies like Japan, Australia and Taiwan, nations such as South Korea and the Philippines that have defense arrangements with the U.S. would try to hedge, according to Minxin Pei, a China scholar and specialist in U.S.-Asia relations. While in Asia, Pence also tried to pull more nations away from China's and into the US sphere of influence, saying the U.S. provides "a better option" for nations in the region and announced a plan along with key Pacific allies to build a $1.7 billion electricity grid in Papua New Guinea. The U.S. also joined with Australia to redevelop a naval base - a show of force which will infuriate Beijing - and held a meeting of “the Quad”, a group that also includes India and Japan, in a bid to balance China’s rising economic and military strength. As a result of this rising geopolitical tension even as the US threatens to boost Chinese tariffs and rates as soon as January 1, and underscoring the market's worst fears, the meetings in Singapore and Papua New Guinea produced little to suggest Trump and Xi would reach a deal when they meet in a few weeks at the Group of 20 summit in Argentina. To be sure, Pence sought to downplay regional concerns that American actions would lead to economic pain and force countries to choose between the U.S. and China: “Great power competition between the United States and China in this region doesn’t have to mean hostility,” Pence said. “These issues can be resolved, we believe, at the negotiation table." What he didn't add is that they can only be resolved if China - and only China - makes the concessions, something which Beijing has made abundantly clear it won't do. Which is why, as Bloomberg concludes, "many in the region don’t expect a deal anytime soon, despite periodic optimism from Trump’s camp." "This is one episode in the hegemonic struggle between the U.S. and China - it will go on for a while,” said Kunihiko Miyake, a former Japanese foreign ministry official who is now a visiting professor at Ritsumeikan University. “It will be a Cold War, whether we call it that or not."